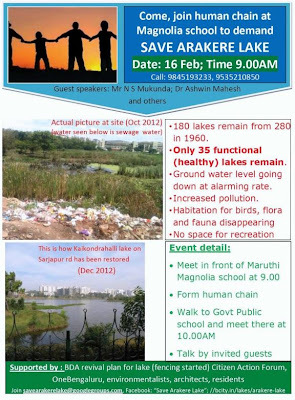 Nirupama Sriram who lives in the JP Nagar 7th Phase area, made full use of the two day bandh (on 20th-21st Feb 2013) by spending time at Puttenahalli Lake and taking photographs of the birds. Her discerning eyes have captured them so beautifully! 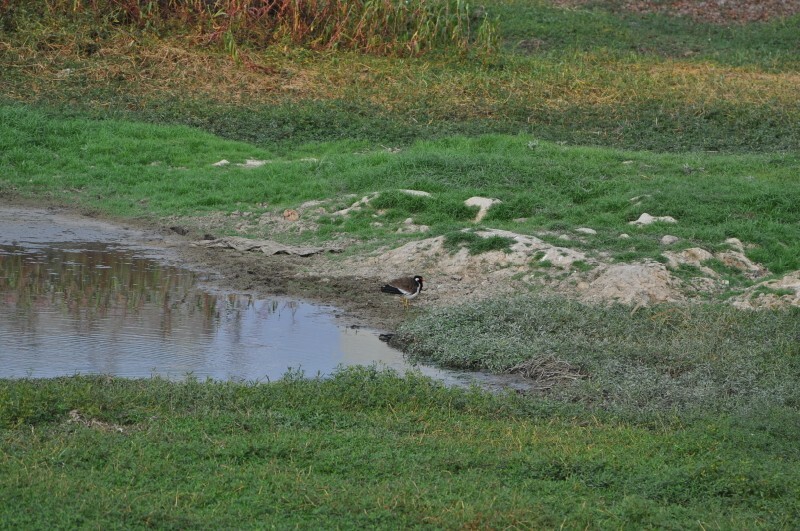 The Wood Sandpiper and Yellow Wagtail are both migratory. 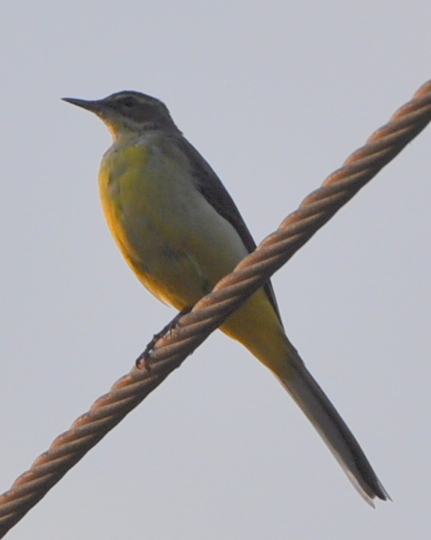 In fact, the Yellow Wagtail is one of the early winter visitors and is likely to begin its return migration soon since it is becoming pretty hot here. 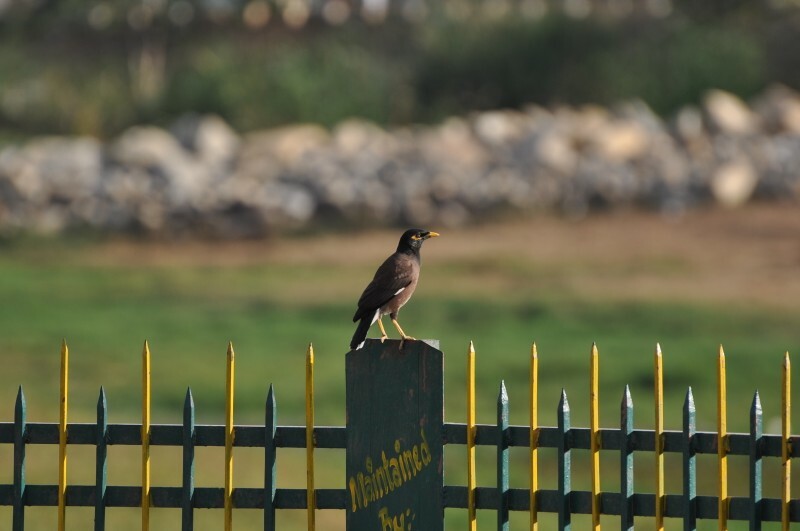 It is easy to confuse between the Mynah and the Rosy Starling. 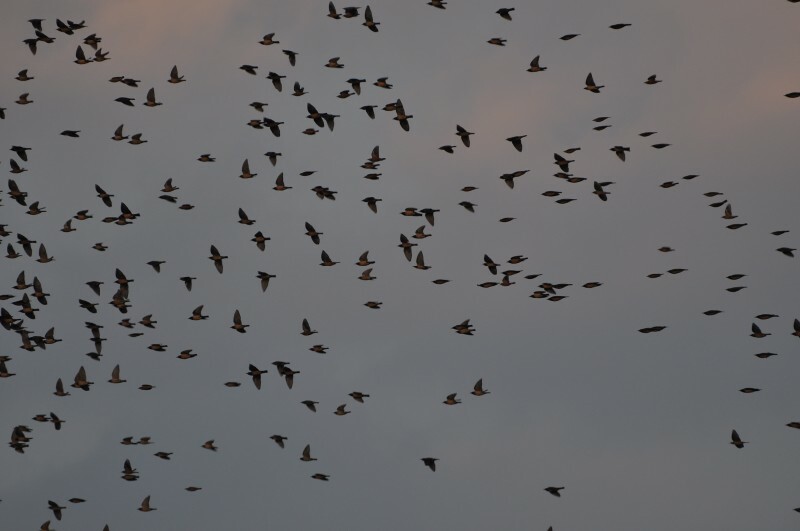 The closeups show the difference - the starling has a rose coloured body. 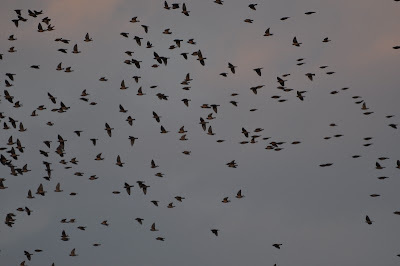 It is also migratory and spends winters in India. 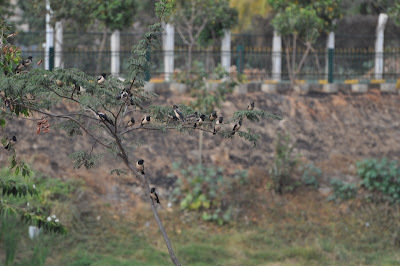 The other birds are residents but no less important to us! 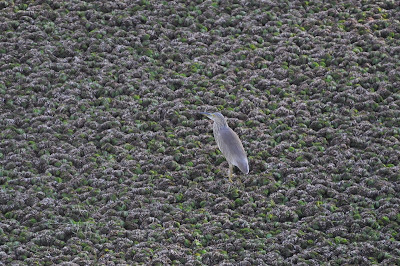 The Pond Heron looks like a silver statue in the backdrop of the Salvinia Molesta! 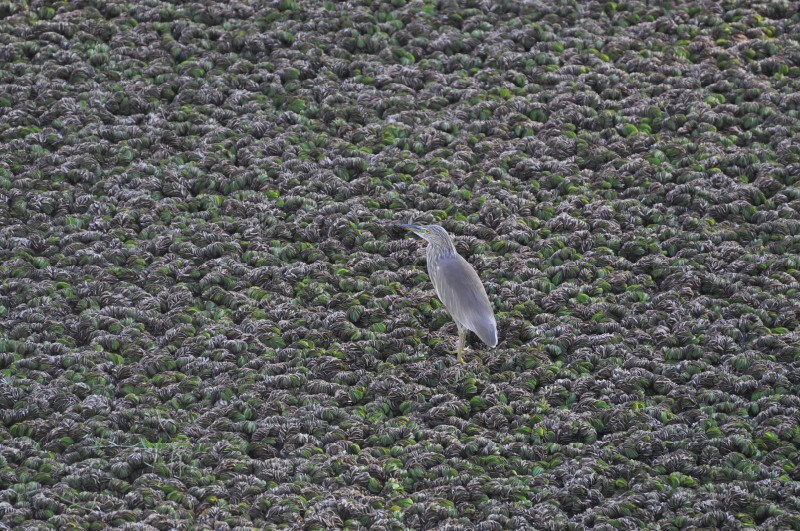 We hope to get the weed removed fairly soon and make the lake attractive to many more birds. 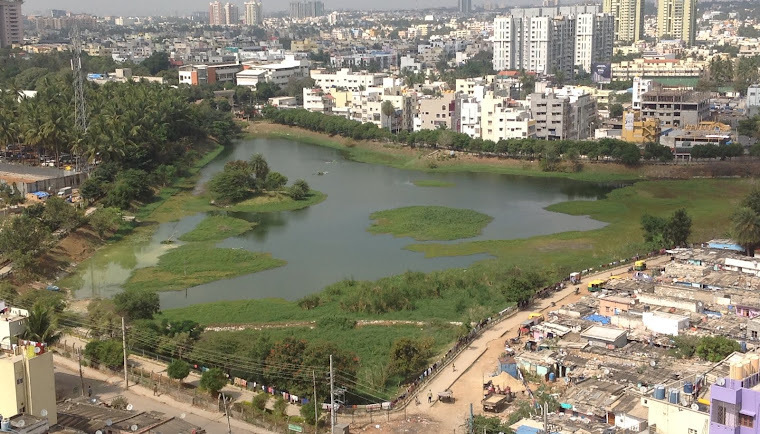 At Puttenahalli Lake, we know the value of rainwater and its harvesting. After all, the only water that the lake receives is from rain. Now here's a good opportunity for artists to help in promoting RWH and win some good prize money too! "Raindrops Geneva Award" is a competition organised by the International Rainwater Harvesting Alliance (IRHA) to highlight the importance of this vital resource – rainwater – and its management. Participants from all over the world send in their entries, and after a vote by the jury, three prizes are given. The first competition, organised in 2007, awarded the poster that best illustrated the positive aspects of Rainwater Harvesting, and the second one, held in 2009, the best short film. The last competition was for photographs that showed the benefits and practical uses of rainwater harvesting. The winning entries are then used to promote rainwater harvesting. Exhibitions were held for both the posters and photographs in the year following each competition. The short films were shown at the Green Film Festival in Geneva, and are still used on the IRHA website to this day. Send in your posters. Details below. "The Best Poster on the Advantages of Rainwater Harvesting"
Competition underway – enter your posters now! We are looking for artists – amateur and professional – to create posters showing the uses and/or benefits of rainwater harvesting. Posters can cover any aspect of rainwater harvesting, for example: domestic use, groundwater recharge, agriculture, or risk reduction. The artist should keep in mind that the aim of the competition is to make the general public aware that rainwater can be (and is!) an essential resource. The best posters will also be used to help us in our important task of promoting the use of rainwater harvesting around the world. This will include exhibitions in the Geneva area and further afield, as well as on our printed media and website. The poster must be remarkably good quality to enable printing up to A0 size (841 x 1189mm), with a minimum resolution of 300 dpi. Its format can be jpeg, pdf, indd, eps or ai. There is a limit of three posters per participant. An entry form must accompany every poster entered. The entry form is available to download by clicking here. Before submitting your poster, please read the Rules of the Competition and fill in your Entry Form. You can also email raindropsaward@irha-h2o.org for more information. The deadline for submission is the 31 October 2013 at 12.00 p.m. (midnight) Greenwich Mean Time, and the winner posters will be announced in November 2013. Good luck and we looking forward to receiving your posters! 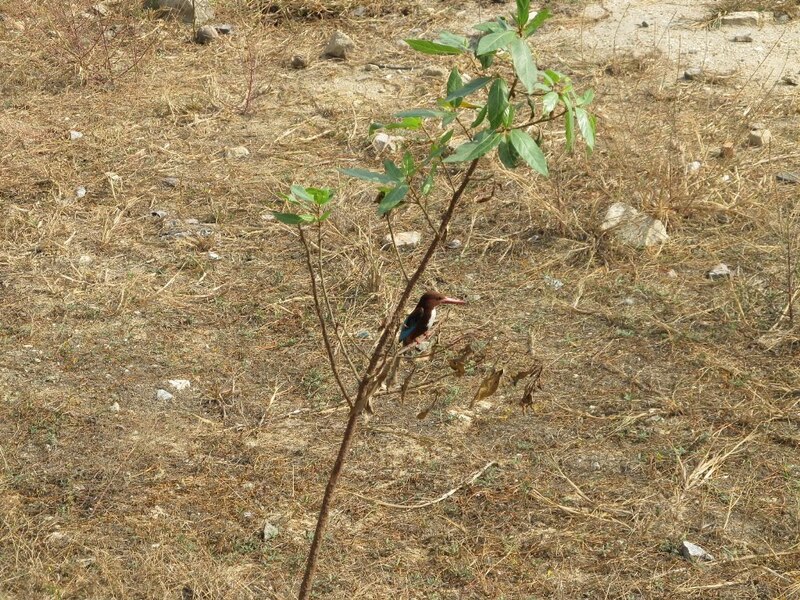 Arekere Neighbourhood Lake Improvement Trust (ANIT) is doing everything it can, to properly save Arekere Lake. The lake is located not far from Puttenahalli Lake, on the other side of Bannerghatta Rd. 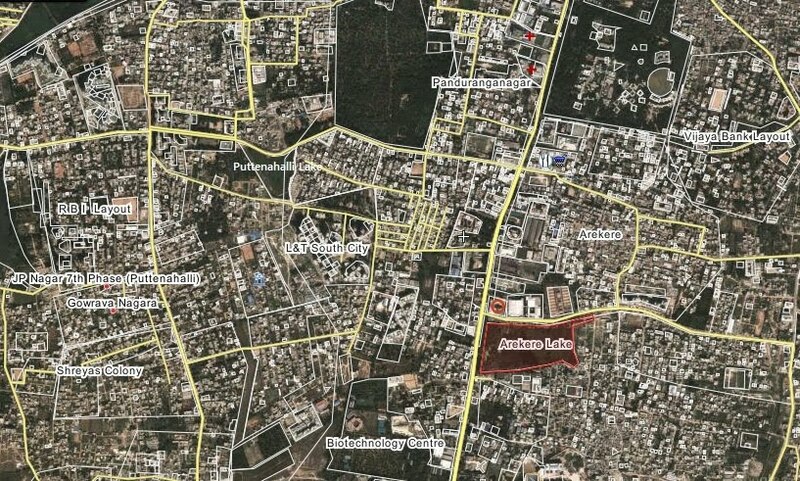 Please see the map below which shows the location of Arekere Lake. 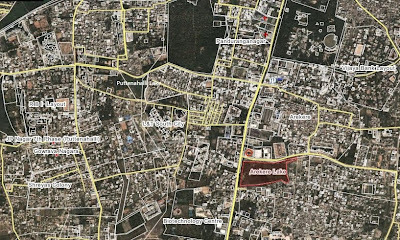 A human chain has been planned on 16th Feb 2013, Saturday @ 9 a.m. starting at Maruti Magnolia School (red circle on the map). Please do join the effort to create more awareness about lakes in general and Arekere Lake in particular. The programme is below. Despite the problems and challenges we have in maintaining our neighbourhood lake, each visit is such a delight and so full of surprises. Today morning even while walking briskly (for a meeting at the Gazebo), a Fig tree growing wild at the edge of the lake caught my eye. There was a white breasted kingfisher sitting on its branch. I went as close to the grill as possible but that little fellow was not bothered in the least. He calmly sat there and let me shoot him (with my camera). 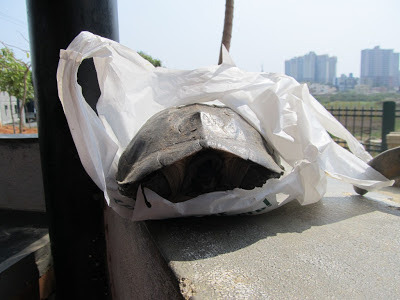 Our gardener Sivalingayya came hurriedly holding a white plastic bag carefully with both hands. What was in it but a big tortoise! It was apparently found walking along the track, sauntering in the 11 o'clock heat if you please. Before any one could spot and pounce on it for its tender meat, Sivalingayya brought it to us. I caught a quick glance of claws and a bit of its nose but the old man kept firmly within his shell. The gardener released it into a small pool of water. Just in case you would like to know, Tortoises live almost exclusively on land. They do not have flippers but normal feet without webbing and often with sharp claws for digging. They only enter water to drink or wash themselves off. They may be found in arid areas and unfortunately our lake qualifies for aridity in these hot days! 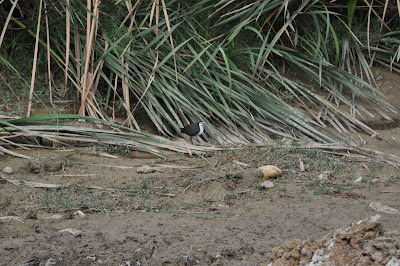 It is quite likely that he will slowly inch his way and come up on the track once again (perhaps cursing us for setting him down on the lake bed!). After all, tortoises are not exactly known for their speed, are they? As you know we have a pair or Purple Herons at our lake. 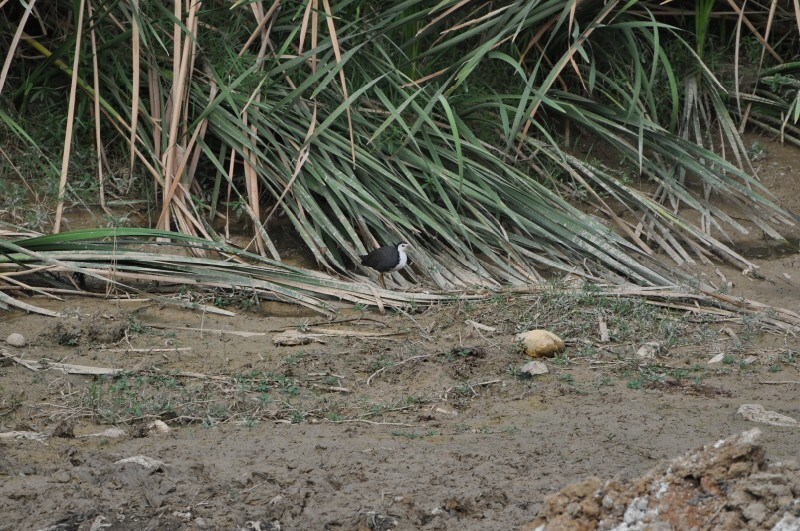 We have spotted them at a distance, standing like statues amidst the bulrush, waiting for a fish or toad to show up. On my way back, I heard some bird sounds from the island. 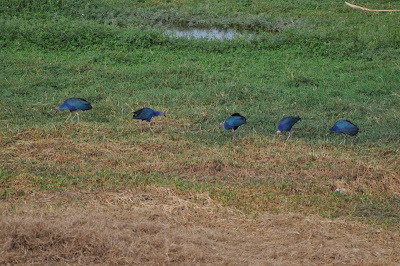 Mynahs flying to and from the island are common and so are the Purple Swamphens that seemed to relish the fruit of the Singapore Cherry growing wild on the island. The new sound was of neither bird. I stopped and took a good look around. 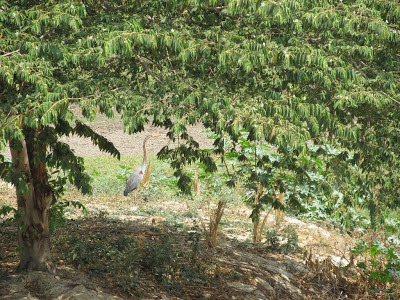 Between the low branches of the Singapore Cherry was our neighbour, the Purple Heron! What was he doing there? 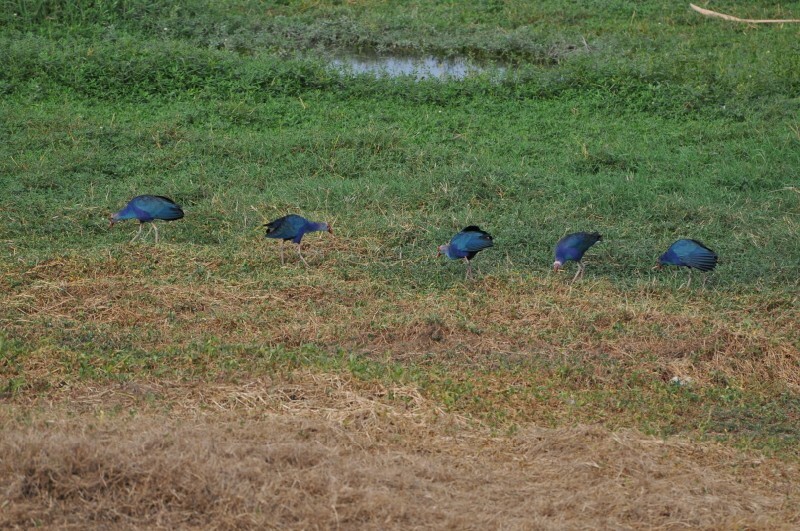 Did he find the heat too much or did he decide to follow the Purple Swamp hen and come to take a bite of the Cherry? Are Purple Herons known to eat such fruit? Only an avian expert can tell. More excitement was in store just a few steps ahead. 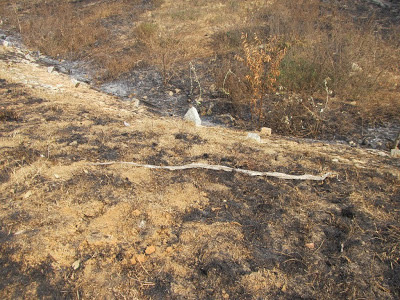 On the slope within the inner grill, on the burned grass was a discarded snake skin, all of ten feet or more! Snakes do this quite regularly. They tend to rub the old skin off against some surface when their new skin is grown. Is it possible to identify the species from the skin? As far as I know, well, it was just the old suit of one long snake which was now slithering somewhere at the lake with a gleaming new skin. Just to allay your fear, it was most probably that of a rat snake and that should not stop you from visiting the lake. Perhaps you will see such exciting scenes yourself and write about them? 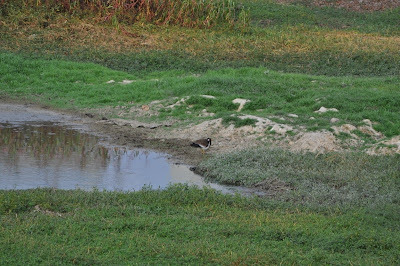 Not many of us would know that today, 2nd February is observed as World Wetlands Day. On this day in 1971, the Ramsar Convention (Convention on Wetlands of International Importance) was signed in Ramsar, Iran and the day has been officially celebrated since 1997. 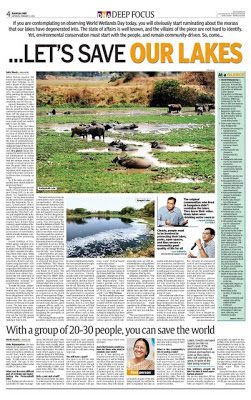 The DNA, Bangalore today devoted an entire page of its newspaper to Bangalore's wetlands. Among other things, it makes mention of the efforts at Puttenahalli Lake and carries an interview with PNLIT's Usha Rajagopalan. 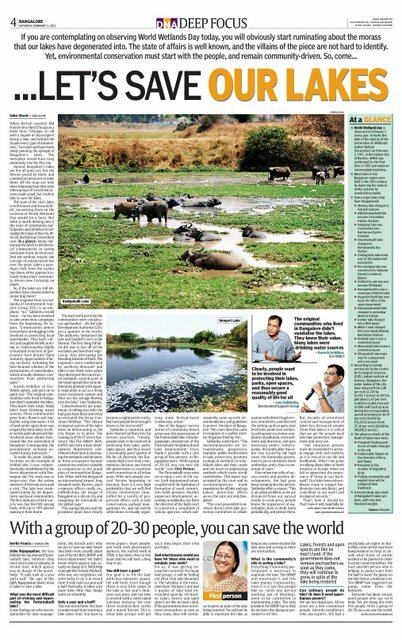 From the DNA article "Let's save our lakes"
More related information can be found the on site of The Ramsar Convention on Wetlands. Early this morning, Chinmayi SK who was visiting Puttenahalli Lake spotted and photographed these three big Woolly-necked Storks. Jacaranda Festival is a community event organized by Jacarandians for our neighboring communities to participate and share the joy. This festival mela is filled with fun-events, carnivals, food and candies for people of all ages. The proceeds from this event are shared with charity organizations and PNLIT is one of the chosen organization by us. The Jacaranda community is proud to be associated with PNLIT in keeping our lake and environment neat and clean. 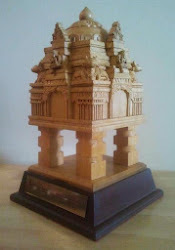 For the first 500 visitors to the Jacaranda Fest on Feb 3, Jacaranda will contribute Rs 10,000 to the PNLIT. From there on, Jacaranda will contribute Rs 1,000 more for every additional 100 visitors over 500. Please ensure that you drop your name in the box kept for this purpose and help us to support our lake. Please encourage PNLIT community to come, participate, promote and enjoy Jacaranda Festival and raise money for the PNLIT cause.